Nestled into the foot of a Listed 18th Century wall on the hillside above Bakewell, Studio House is a typical 19th Century cottage. 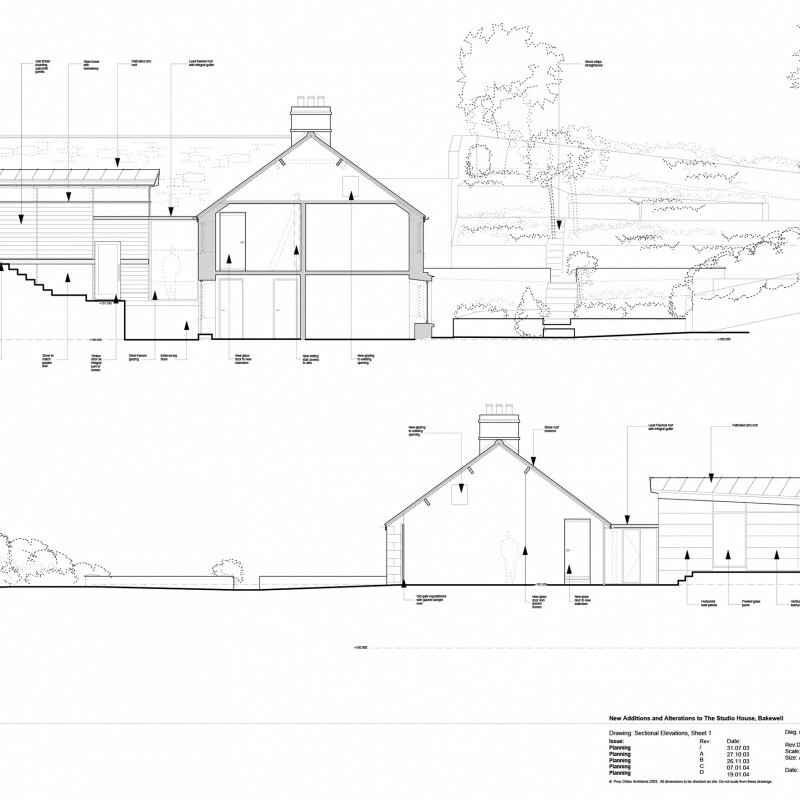 The scheme aimed to restore and extend the existing house to improve the accommodation, taking in the best of the views whilst managing the significant level changes across the site. The restored roof line of the existing house is joined half way up by a simple bronzed copper roof. When the existing ledged and braced door is opened, the eye rises up to the exposed underside of the roof structure. Wooden pegs holding the slates in place make reference to the age and crafted character of the original structure. The Listed boundary wall becomes exposed along the full length of the garden. Long perspectival views along this wall and through to the new extension accentuates the feeling of space. The new studio extension enhances the existing historical building and gardens through the use of scale, form and traditional materials in a contemporary way. The studio extension itself seeks to create a space of the size and scale not found in the rest of the house. It manages the significant level changes of the site by sitting slightly above the higher lawn level, giving long views from the house over the Wye Valley. Although the new space has a very different feel to the existing building, it is both sympathetic and complementary to its context. From the outside, the garden room gives the impression of intimacy. Internally, the light and airy space deliberately differs from the cosier spaces of the existing house. The rhythm of the façade echoes that of the landscape, and the transparency of the external wall gives the impression of lightness.